Qinhuangdao (China), May 17 : Indian woman boxer M C Mary Kom's Olympic ticket will be decided by fate now after she lost in the quarterfinals to world number two Nicola Adams in the World Championships here today. The five-time world champion will return empty-handed on the medal front for the first time since the event's inception in 2001 but she still has a chance to get the London berth if Adams goes on to win her semifinal bout. Women's boxing will make its Olympic debut in three weight categories in London -- 51kg, 60kg and 75kg. Asia has two slots in the 51kg division and one of them has already been taken by Asian Games gold-medallist Ren Cancan of China. The 29-year-old Manipuri went down 11-13 in a fiercely-contested battle in which she was tied with Adams on points in two of the four rounds. Mary and North Korea's Hye Kim have ended up on the losing side in the quarterfinals and their respective opponents -- Adams of England and Elena Savelyeva of Russia -- will be facing off in the semis now. The winner of the bout will decide which among Mary Kom or Kim goes through to the Olympics. Mary Kom conceded a point's lead each in the first and third round, which ultimately proved decisive in the bout. "I gave my best but still lost, what can I say? I don't know if I have a chance or not. 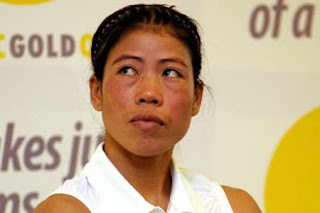 I don't want to think about it," a dejected Mary Kom told PTI after her bout. "It's difficult, I have to rely on luck which is not what I wanted to. I wanted to win it all by myself," she added. Devi (60kg) are on the same boat and will know if they have got the Olympic berth only after the semifinal stage. There was some good news for India in the non-Olympic categories as Kavita assured herself of a medal by advancing to the +81kg division semifinals. She beat Turkey's Semsi Yarali 15-14 to make the medal round. But there was disappointment elsewhere as Pinki Jangra (48kg) went down to world number two Svetlana Gnevanova of Russia 11-13. In the 81kg division, former world champion RL Jenny lost 11-18 to Hungary's Timea Nagy. Indian Women making it to women's boxing debut at olympics...great going Mary..gud luck!! !